Baglamukhi is the goddess of power to destroy the enemy, of black magic, of poisons. She rules over the subtle perception which make us feel at a distance the death or miseries of those we know. She incites men to torture one another. She revels in suffering. Though the procedure to perform the ritual is being given it is advised to perform the same under the guidance of Revered Gurudev Swami Bhaneshwaranand after receiving Baglamukhi Deexa..
Bagala or Bagalamukhi is the eighth Mahavidya in the famous series of the 10 Mahavidyas,Kali , Tara, Shodashi, Bhuvaneshvari, Chhinnamasta, Bhairavi, Dhumavati, Bagala, Matangi and Kamala. 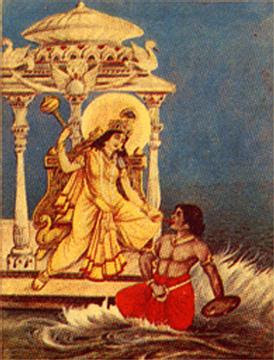 She is identified with the second night of courage, and is the power of Shakti or cruelty. Bagalamukhi rules magic for the suppression of an enemy's gossip. These enemies also have an inner meaning, and the peg she puts through the tongue may be construed as a peg or paralysis of our own prattling talk. She rules deceit, which is at the heart of most speech. She can in this sense be considered as a terrible or Bhairavi form of Matrika Devi, the mother of all speech. .
Om. Of this Hymn of Shri Bagala Mukhi, Bhagavan Narada is the rishi. The aspect of divinity is Bagalamukhi. The destruction by paralysis of one's enemies' speech, mouth, legs, mind, and the grace of Shri Bagalamukhi in the success of this aim is fruit of the mantra's application. Om Hrim obeisance to the thumbs. Om Bagalamukhi to the index fingers Svaha. Of all the bad to the middle fingers Vashat. Om speech, mouth, feet, paralyses to the ring fingers Hum. Om peg! peg! The tongue! to the little fingers Vaushat. Destroy the mind! Hlim Om Svaha to the·front and the back of the hands Phat. Thus also in the heart and so forth. Now the meditation: Seated on a gold throne, with three eyes, wearing yellow, blissful, with limbs as bright as pure gold, wearing a garland of champaka flowers, with the moon as her diadem, with her hands holding a hammer, and a noose which binds the enemy; her limbs arrayed with jewels, in this way I meditate on Bagalamukhi, the All-Paralyser of the Three Worlds. Now the Mantra: Om Hvlim Bagalamukhi Paralyse the Speech, Mouth and Feet of all enemies: Nail down, Nail down the tongue. Destroy the mind. Hvlim Om Svaha. Om. I worship Devi surrounded by yellow, wearing yellow clothes, jewel and unguent and ornaments, seated on the lion throne on a dais within a ruby pavilion in the center of the wine ocean, Who bears a hammer and binds the tongue of the enemy. The Devi who has seized the tongue and so forth of the enemies with her left hand, and who with her right hand hammers them, with yellow garments and with two arms -- her I worship. Whosoever should worship Devi's lotus feet devotedly, giving yellow flowers with his left hand, that mantrin's mantra becomes successful. Whosoever wishes to subdue by the bija (mantra) should do the pitha meditation (i.e. on the red lotus). Remembering that. His enemy's mouth, speech and heart are paralysed, he causes this instantly. Whosoever, knowing her mantra, should recite this hymn which crushes enemies in front of her yantra becomes the conqueror of the three worlds and renowned. O Mother-Bhairavi, Bhadra-Kali, Vijaya, Varahi, Vishva, Shraya, Shri Vidya, Maheshi, Bagala, Kameshi, Ram, Matangi, Tripura, Above All, Guardian of Heaven, Giver of Things, I am Your servant seeking refuge in You, Lady of the Cosmos! Protect me in war and in battle. Whosoever reads this auspicious text (whether) in the thick of war, in assemblies of thieves, in conflicts, in jail, on water, in magical attack, in litigation, in facing a king's wrath, at the time of an ordeal, at night, in fetters or in paralysis, in the slaughter of battle amongst enemies, in a desert, or in a forest, or at any time, becomes steady. Whosoever reads this pure hymn having offered to the yantra and who wears it on the right wrist or round the neck is protected in war. Having done this act of recitation, O Parameshvari, I am the seizer and punisher of the wicked. This Sacred and Reliable Hymn is renowned throughout the Three Worlds. One should never give this to those who are not devoted to the guru. One should meditate on she who has two arms, wears yellow garments, with three eyes, a body of effulgence, holding in her hands chisel and hammer, the Bagalamukhi.